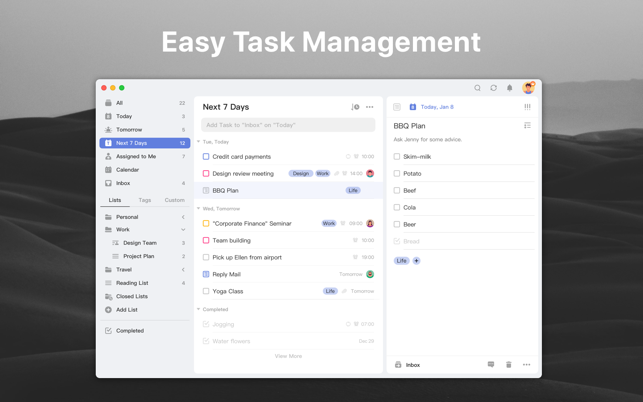 Design exclusively for macOS, TickTick is your daily must-have to-do & task list to get all things done. 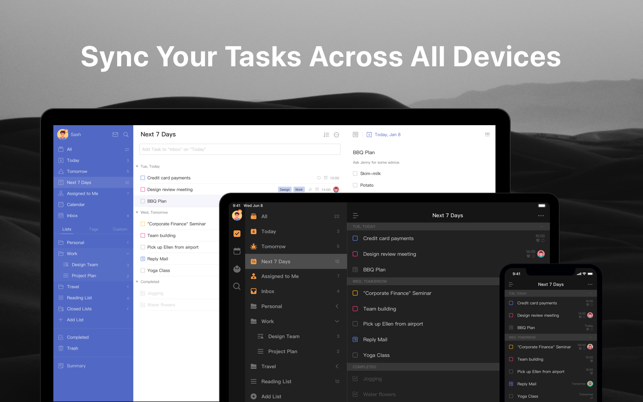 TickTick can be accessed on more than 10 different platforms including Mac, iPhone, iPad, Apple Watch which enables you to manage tasks on all your devices/Web. 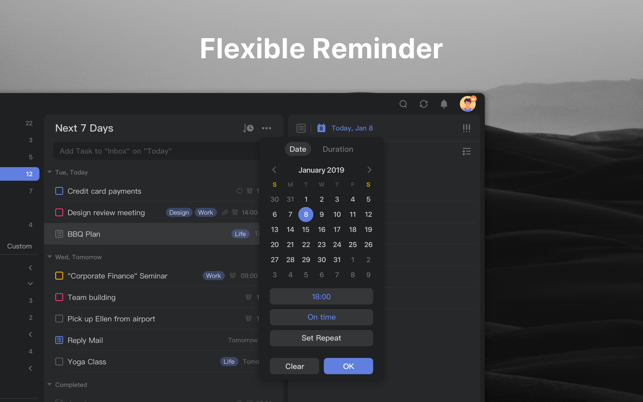 TickTick is free but you can also upgrade to Premium account for full access of premium features for $2.99 a month or $27.99 a year through an auto-renewing subscription. Subscriptions for Premium account will be charged to your credit card through your iTunes account. Your subscription will automatically renew unless cancelled at least 24-hours before the end of the current period. You will not be able to cancel a subscription during the active period. You can manage your subscriptions in the Account Settings after purchase. Say hi to TickTick Mac 3.0! - New UI. New themes. It looks better and it works better. 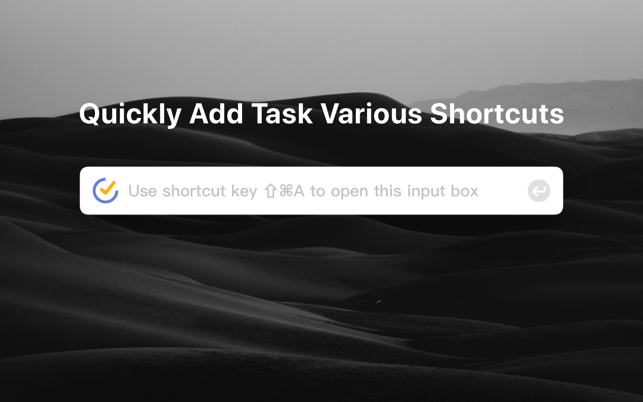 - Drag to adjust the size of the main window. You can now reduce the three columns to two columns or even just one! 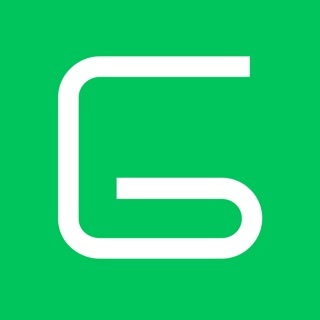 We'll read all reviews in App Store and evaluate your feedbacks carefully. Feel free to contact us at support@ticktick.com for further inquiries. I’ve used a variety of digital and paper planners. I have to say, tick tick is the best I’ve come across so far. I think there is a powerhouse of features under the hood and a fair amount of customizable themes as well. It keeps the overall app fresh, plus there are regular updates. I was originally using Nirvana app (GTD method) for my to do lists and whatnot, but have now started creating those lists in tick tick. While some of the more fine tuned aspects of Nirvana get lost, the functionality (for me) is about the same. I like that I can have my lists and planner all in ONE app. Very convenient. I also have to say, the option to attach files to any planner event is a lifesaver. Gone are the days looking for an email to provide me some info on an event. Now I screen shot the email (or anything) and can instantly attach it. 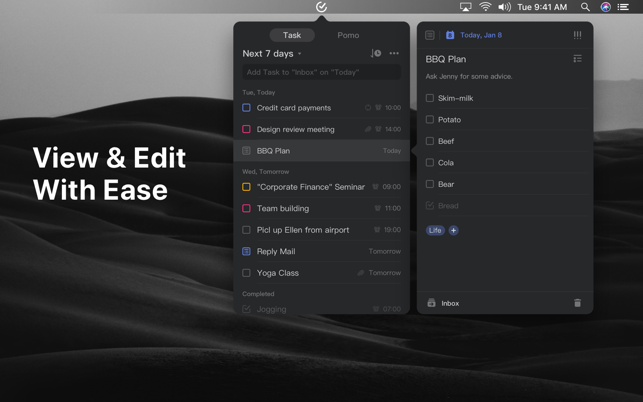 The only things I would ask be improved are adding the premium dark theme that’s on the iphone and ipad to the desktop version. Also, on the iphone app you can press and hold to arrange your daily tasks in month view. I wish this feature was also available on the desktop version for month view. Aside from these minor issues, it’s a wonderful app and worth the cost. I made the switch from Wunderlist and TickTick made it perfectly easy with the import feature. I was nervous about making the switch, but it was very smooth and comfortable. I’ve tried and tested many other task mangers and they've all fallen short of specific features to make a perefect to-do list for me to use. TickTick is the winner! It has many options and I love using it to keep my work life in much needed order. TickTick seems very stable and the friendly dev team seems to be constantly working to add more features and fixing bugs. Suggestions: It would be great for the description list area to open up in a new, smaller window for a cleaner working environment. Also, the ability to change themes on the Mac would be awesome. This was one thing that I was excited about when making the annual payment but then I became disappointed after installing the app. A task progress bar or visualization would be nice as well. PLEASE create a separate volume control for the Pomo timer sound!! Guys I need to watch SO many videos, talk to SO many people on and through my computer, but I LOVE the ticking clock of the Pomo. It really doesn't matter which sound I'm using - if I have to turn an essential video up, I have to turn the Pomo sound OFF, and that's dangerous for me because it's very easy for me to forget about it when I mute it! Yes it shows the circle slowly filling out, but I'm always on my tasks, not my pomo, so I don't see that either! Please please please add this feature :D everything else is truly perfect - amazing price, incredible and unbeatable features. In my opinion, you're a fool to not have Ticktick (after learning about it)!